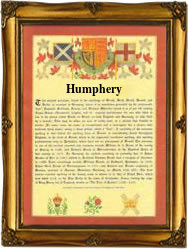 This surname is of early medieval English origin, and is a patronymic of the Old French male given name "Humfrey", introduced into Britain by the Normans after the Conquest of 1066. It is derived from the Germanic elements "hun" meaning "bear cub" and "frid" or "fred", peace. St. Humfrey, the 9th Century bishop of Therouanne, had a certain following in England among the Norman settlers, and no doubt this contributed to the popularity of the name. Interestingly, until the early 14th Century, the name appears to have been confined to the nobility and the learned sections of the populace, such as scribes and scholars in great houses and monasteries. As a personal name, it appears both as "Hunfridus" and "Humfridus" in the Domesday Book of 1086. One William Humfrey, noted in the Book of Fees for Bedfordshire, circa 1240, is the earliest known bearer of the surname, which in the modern idiom is variously spelt Humph(e)ry, Humfrey and Homfray. The patronymic forms, having a final genitive "s", include Humphr(e)ys, Humphries, Humphris(s), Humfress and Humpherson. On November 2nd 1567, Edward Humphreys and Joan Bideawhite were married in Bromfield, Shropshire. A Coat of Arms granted to the Humphreys family depicts a black lion passant guardant on a silver shield. The first recorded spelling of the family name is shown to be that of Annys Humfreys, which was dated December 8th 1550, christened at Dymock, Gloucestershire, during the reign of King Edward V1, known as "The Boy King", 1547 - 1553. Surnames became necessary when governments introduced personal taxation. In England this was known as Poll Tax. Throughout the centuries, surnames in every country have continued to "develop" often leading to astonishing variants of the original spelling.